David Tennant's TV Appearances For Today are posted each day throughout the year on David_Tennant on Twitter. David stared in the drama Spies Of Warsaw which aired in the UK on 9th and 16th January 2013. It aired in America on 3rd and 10th April and during May in Australia, France and Germany. David Tennant stared in the eight part emotional police drama Broadchurch for ITV which aired from 4th March and was a ratings success. BBC America screened it from Wednesday 7th August, ABC1 in Australia from Friday 12th July and on Showcase in Canada from Sunday 4th August. David Tennant will appear in the American remake of Broadchurch which will film from January 2014 and will be called Gracepoint. David also starred in The Politician's Husband for BBC Two which was broadcast in April and May, plus he has filmed The Escape Artist for BBC One which starts on Tuesday 29th October. 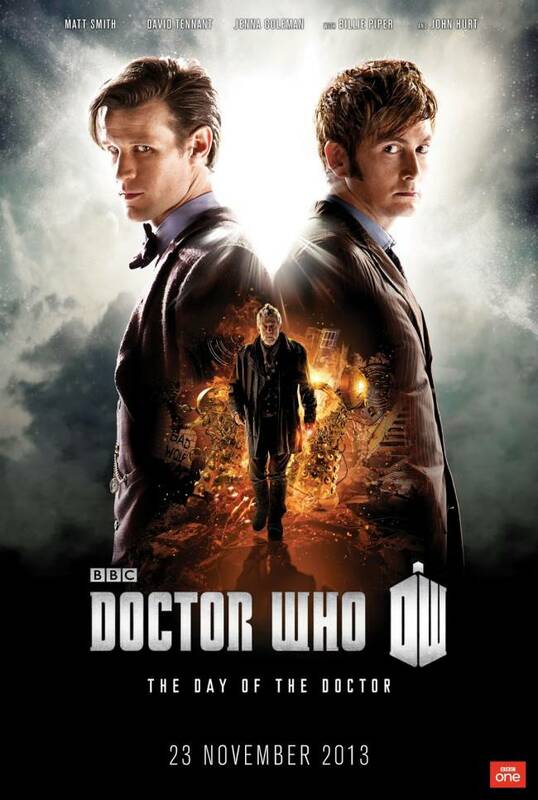 David Tennant and Billie Piper appeared in the Doctor Who 50th anniversary episode which was broadcast on Saturday 23rd November. David Tennant narrated the three part nature documentary Penguins - Spy In The Huddle which was broadcast on consecutive Mondays on BBC One from 11th February. All of David Tennant's episodes of Doctor Who are frequently repeated on Watch and Watch + 1. For posts related to David Tennant on Other TV Shows on Blogger.com click here. Over the years David Tennant has appeared in numerous television programmes both as an actor and as himself. This section of the website looks at his most recent appearances. The Huffington Post have chosen the reveal of who killed Danny Latimer in Broadchurch as the Most Dramatic TV Moment of 2013. Broadchurch has been nominated for Best Drama Series or Serial Award in the Broadcast Awards shortlist. The overnight ratings for Doctor Who last night were that it was watched by an average of 10.18 million people which was 37.4% of those people watching television at that time. It means that it comfortably beat The X Factor on ITV in that time slot which only received 7.67 million viewers (28.6%). Last night's Doctor Who Twitter statistics have been posted to Twitter. It shows that almost half a million tweets using the hashtag #DoctorWho were posted around the time of broadcast. Channel Four have added a video of their interview with David Tennant. David Tennant's interview on Channel Four News (which he filmed last Wednesday) will be broadcast tonight sometime between 7pm and 7.55pm. Radio Times has confirmed that The Day Of The Doctor will premiere on BBC One (and worldwide) from 7.50pm GMT until 9.05pm on Saturday 23rd November. Digital Spy has announced that David Tennant and Matt Smith will be on The Graham Norton Show on Friday 22nd November. The first episode of The Escape Artist premieres on BBC One tonight at 9pm. The BBC have announced that Doctor Who will again contribute to the Children In Need Show on BBC One on Friday 15th November. BBC America have posted the trailer of The Doctors Revisited - The Tenth Doctor to YouTube. David Tennant will reprise his role as Detective Inspector Alec Hardy in the American remake of Broadchurch. The eight part series is being made for the station Fox and will film from January with an expected broadcast date of late 2014 or 2015. Both Entertainment Weekly and TV Guide were the first to break the news. Doctor Who News says that David Tennant, Freema Agyeman and Steven Moffat will be interviewed for The Doctors Revisited: The Tenth Doctor. At 8.25pm tonight the 'sting' was that the BBC announced that The Day Of The Doctor hashtag is #SaveTheDay with a voiceover by Matt Smith. Amazon now lists The Escape Artist DVD to be released on Monday 18th November. It previously was 28th October. Radio Times reports that David Tennant's The Doctors Revisited (Tenth Doctor) will be on Watch on Sunday 10th November at 2pm followed by a showing of The Stolen Earth and Journey's End. Voting for the National Television Awards has opened. Both Broadchurch and Doctor Who have been nominated for the Best Drama Award and David Tennant has been nominted for the Best TV Detective Award for DI Hardy in Broadchurch. There's no exact date yet but Toutelatele reports that Broadchurch will be shown on France 2 on Monday nights after Season 5 of Castle has finished. The Twelfth Doctor will be named on BBC One at 7pm tonight in a show which will be broadcast simultaneously in several other countries. 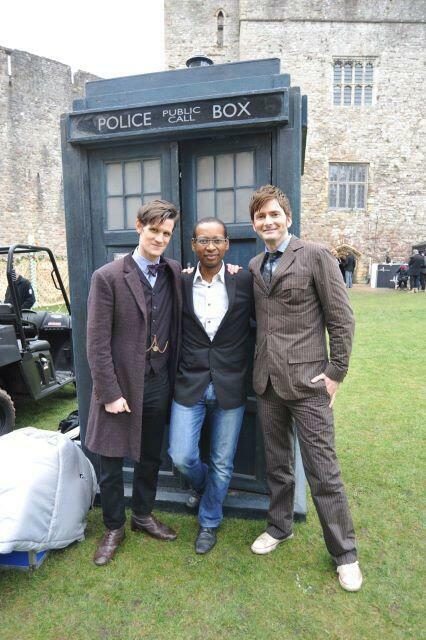 Some former Doctors will be on Twelfth Doctor programme tonight but David Tennant is not listed. Broadchurch will premiere in Brazil on the station GNT at 8.30pm on Monday 5th August. From today Tree Fu Tom will be shown on NBC in the US. David Tennant programmes Broadchurch, Twenty Twelve and Tree Fu Tom have all been nominated for various Freesat Awards. Broadchurch is nominated in the Best Of British: TV Programme Or Series category. Twenty Twelve is nominated in the Best Of British: Sitcom category. Tree Fu Tom is nominated in the Best Children's TV Programme or Series category. Apparently Broadchurch started being Broadcast in Crotia last week. This is the first non-UK country to show it. Broadchurch will air on BBC America from Wednesday 7th August at 10pm EST. TV Ratings have a graphic of the Top 25 Watched Programmes in 2013 up to 5th May and the final episode of Broadchurch is at number 7. Episode one of The Politician's Husband is broadcast on BBC Two at 9pm tonight. ITV Press Centre has confirmed that a second series of Broadchurch has been commissioned. The new series will go into production next year. Doctor Who: The Doctors Revisited - The Fourth Doctor will premiere on BBC America on Sunday 28th April with David Tennant interview clips again. The Doctors Revisited: The Third Doctor premieres on BBC America tonight in the US at 8pm (Eastern). It includes new David Tennant interview clips. The new issue of Doctor Who Magazine (which is published on Thursday) has announced that David Tennant and Billie Piper will appear in the Doctor Who 50th anniversary special episode which will air on Saturday 23rd November. The episode will receive a limited worldwide 3D cinema release. Also starring in the episode will be John Hurt. One of David Tennant's films from Uganda for the last Comic Relief was shown tonight and afterwards David spoke to camera emphasising how many people watching the programme did not donate and had never donated. Afterwards loads of people tweeted that they had donated for the first ever time. On Sunday on both BBC One and Two there will be compilation shows of the best bits of Comic Relief (so will probably include David Tennant). David Tennant and Olivia Colman's interview about Broadchurch will be shown on Daybreak on ITV on Monday.